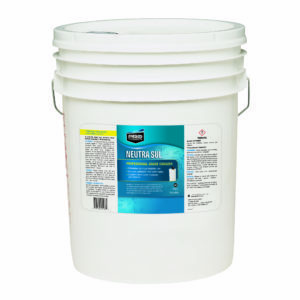 Pro Neutra Sul, a professional grade oxidizer, is formulated to reduce common odor causing contaminants such as hydrogen sulfide (rotten egg odor) and iron, from any water supply through oxidation. Using Neutra Sul in place of Hydrogen Peroxide 7% solution prevents the formation of colors, tastes, iron and scaling when used in conjunction with post treatment processes. To enhance system performance feed Neutra Sol before oxidation media such as Centaur Activated Carbon, GreensandPlus, or Katalox. To protect against odors in treated water. And insure consistent performance. The stabilizer in Neutra Sul provides five times the shelf life of standard 7% hydrogen peroxide. Use it to enhance the performance of oxidation media in low oxygen water supplies such as deep wells. Available in 1 (HP41N), 2.5 (HP22N) and 5 (HP05N) gallon sizes. More powerful oxidant than chlorine and potassium permanganate. NSF certified to meet NSF/ANSI 60 standards for drinking water additives. Normal procedure for oxidizing a water supply is usually specified by the chemical feed pump manufacturer or supplier and depends on water conditions. There are many types, designs and methods of introducing Neutra Sul to the water supply. A normal method is to inject it directly into the water line with the use of a chemical feed pump. Dosage rates will vary. If unsure consult owner’s manual. For oxidation of impurities, feed until there are very few oxygen bubbles in treated water. For iron treatment, feed at 2 ppm per 1 ppm of iron. For hydrogen sulfide treatment, feed 2-3 ppm per 1 ppm of hydrogen sulfide. Pro Neutra Sul is a clear, chemically stable, liquid formulated with 7% Hydrogen Peroxide. Store in a properly vented area and away from sources of direct heat and combustible materials. Read relevant SDS before handling product. Ships via common carrier; do not ship via UPS. Please contact us to order or to find out more information.